Play Book of Ra™ deluxe Bingo online for free now! Once upon a time there was a classic Bingo game that fell in love with a popular slot Book of Ra™ deluxe. Despite the resistance of all the other games, that didn't approve of this love affair, the two games came together and you can see the result here! 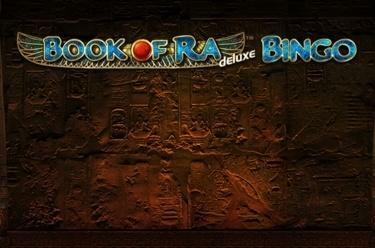 With Book of Ra™ deluxe Bingoyou get the best of both worlds: If you land a bonus Bingo with 30 balls and up to 11 extra balls, you win ten extra rounds with the popular slot Book of Ra™ deluxe! One winning pattern on one of the four Bingo cards and the Twists are yours! For every stake, 30 balls will be drawn; as soon as the marked off numbers form a complete pattern, you’ll be a winner. After the regular draw and in certain circumstances, you’ll have the opportunity to buy up to eleven extra balls to increase your chances of winning even further. Your Bonus Pattern triggers the Book of Ra™ deluxeBonus Game!